The fire near Port Underwood spread to more than 6 hectares of vegetation and damaged property in December 2013. A felled pine, a broken line and a bush fire. The not-so-extraordinary ingredients for a dispute between a lines company and the fire service, who both argued the other should foot the firefighting bill of more than $100,000. 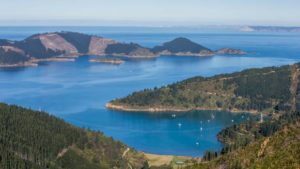 Four years after an out-of-control fire in the Marlborough Sounds, the High Court has upheld a previous judgement against Marlborough Lines. The fire started after a person carrying out work at a property on Tumbledown Bay Rd, near Port Underwood, felled a tree across power lines on December 21, 2013. The blaze spread to more than 6 hectares of vegetation and damaged property. The New Zealand Fire Service Commission and the Marlborough Kaikoura Rural Fire Authority put out the fire, incurring costs of $107,089. Judge Tony Zohrab made a summary judgement on the case at the Blenheim District Court in March. He ruled against the lines company, and said they failed to identify or take any steps to deal with the risk presented by the tree. “I acknowledge that the evidence suggests it was relatively young and healthy, but its size and proximity alone present as a potential hazard,” he said. The fire service successfully argued the company was responsible for the fire under the Forest and Rural Fires Act. An appeal against Judge Zohrab’s decision was heard last month in the High Court of New Zealand in Wellington. Marlborough Lines lawyer Jane Forrest said the company did not have the ability to guard against the intervention of others, such as the resident who felled the tree. Forrest also argued it was unrealistic and impractical for the company to anticipate the risk of “negligent felling” in a region of Marlborough’s size. Judge Peter Churchman said the issue of whether or not the sequence of events which led to the fire was “extraordinary” was of critical legal significance in his decision released on Friday. If the events leading to the fire could be categorised as “extraordinary” then no liability would be attached to Marlborough Lines. According to Forrest, the tree was young, healthy and outside the zone where trees must be trimmed or cut down due to proximity to power lines. Fire Service Commission lawyer Bruce Scott said the sequence of events did not fit with the term “extraordinary”. “There is ample evidence, and no real dispute from [Marlborough Lines], that it is not extraordinary for fires to be caused by trees damaging power lines, including because of trees being felled onto the lines,” he said. Judge Churchman agreed with Judge Zohrab that Marlborough Lines was liable for the fire. Costs in relation to the appeal were reserved, and Judge Churchman invited the two parties to attempt to resolve costs of the appeal between themselves.